At the end of the nineteenth century, Casa Daniela was a simple country house. Today, lovingly restored, it is a place in which one can relax and take it easy. The original floors, the large fireplace, the bright open kitchen and the lovely bathroom help to make this retreat a true jewel. The house itself is a beautiful old farmhouse, comfortably decorated whilst retaining its charm. It is located in small hamlet with houses around and a road running along one side of it, so do expect some noise from cars, people, dogs etc in the morning. The main apartment has one double bedroom. A second, self-contained unit consists of one room with sofa-bed and kitchenette and a bathroom. The beds are comfortable, the main apartment is lovely, but the second bedroom/apartment suffers more from noise and heat. The entrances to the two apartments are right next to each other (as per the photo). The main apartment is well-equipped, but has no wifi or washing machine. The surrounding countryside is very beautiful indeed, and the views from the windows are stunning, especially at sunset. 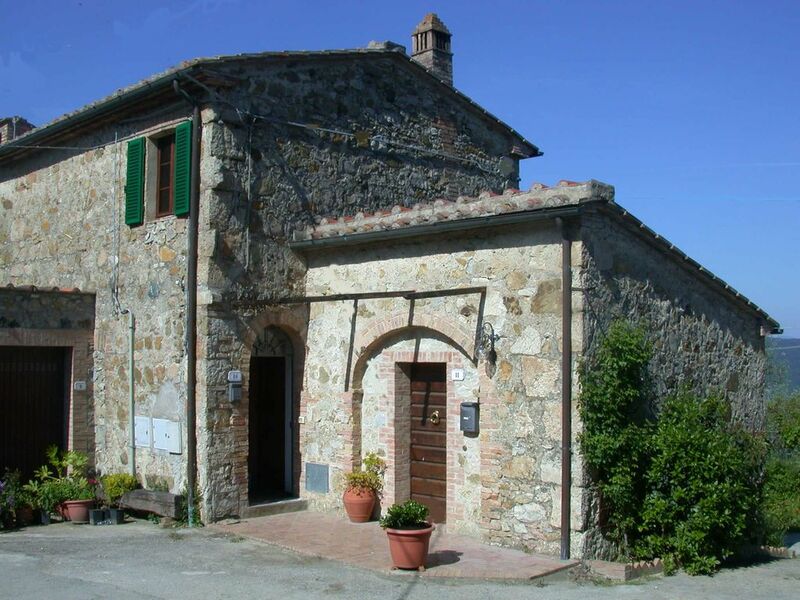 The nearby village of Casciano has all the facilities you need, with amazing local meat from the butchers and the grocery store. A car is needed to make excursions to some of the beautiful national parks in the area, for example the Alto Merse park (20 minutes) or the Maremma park (50 minutes). Siena is only 25 minutes away, and numerous other beautiful towns, village and other sights are within easy distance. A small horse riding stables is close by (Ipodromo Bellaria) for some basic horse-riding. Overall, a highly recommended stay especially for a couple using the main apartment only, although I would expect to pay a few euros less for what is then a one-bedroom apartment. Siamo stati molto bene, la casa è rustica ma allo stesso tempo confortevole ed elegante. La casa si trova in un piccolo borghetto abitato da 4/5 famiglie, la famiglia della Sig.ra Roberta che ci ha accolto è sempre stata gentilissima e cordiale. Unica pecca della vacanza: il cane dei vicini, tutte le mattine abbaiava come se non ci fosse un domani e i proprietari del cane non hanno mai fatto nulla per zittirlo. This tiny village is an ideal starting point for many tours and explorations throughout the picturesque region. The closest large town is Sienna, just 20 km away.